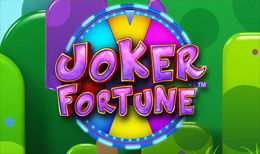 Find your fortune with Joker Fortune! This animated slot machine game combines the fun of classic fruit machines with the excitement of the wheel of fortune, plus jokers are wild. With rich animations, multiple game screens and features like free spins, two different wheel of fortune games and win lines that pay both ways – this game is no joke!